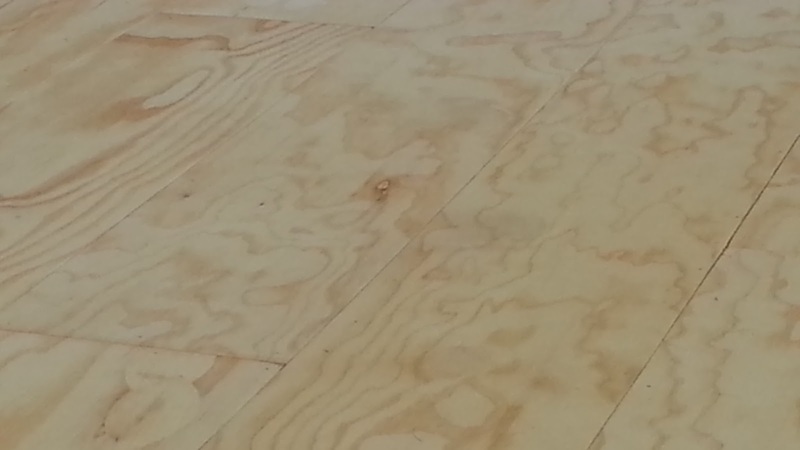 Plywood flooring? 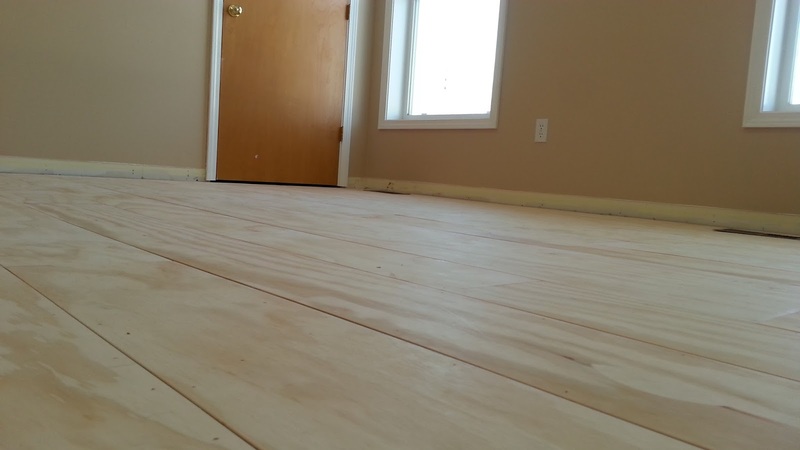 Check out this inexpensive alternative to traditional wood flooring that you can do for less than half the cost. 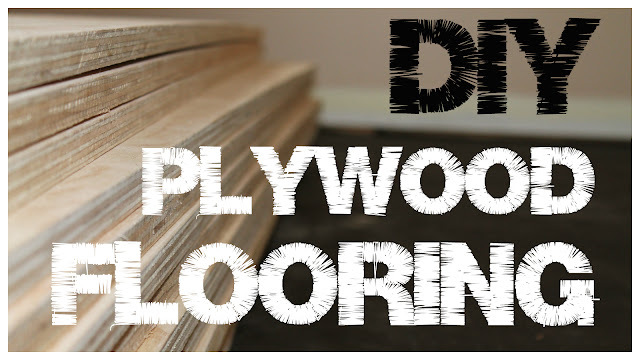 Although plywood flooring is not as durable as a solid wood floor it is by far less expensive and with the proper treatment can last many many years in great condition. I started this project in order to give some relief to my middle daughter who suffers from allergies and asthma. The carpet was old and when you walk on carpet, no matter how clean you think you get it, it kicks up dust and allergens. It was time for something different for her. Although this was a priority we didn't have the money in the budget for a new hardwood floor and after looking into other options (reclaimed wood, laminates, etc.) we decided to give the plywood flooring a try. I have seen a few other videos and posts around on the net and it seems most have pretty good results. So, with a budget in mind I was off to our local building store (you guess which one). Our room was 165 square feet so I needed to get about six sheets of plywood to cover the area. That is based on 32 square feet per sheet with a little bit extra. I ended up going with a thicker plywood than I had originally thought because I really liked how flat the sheets laid and also for long term durability. 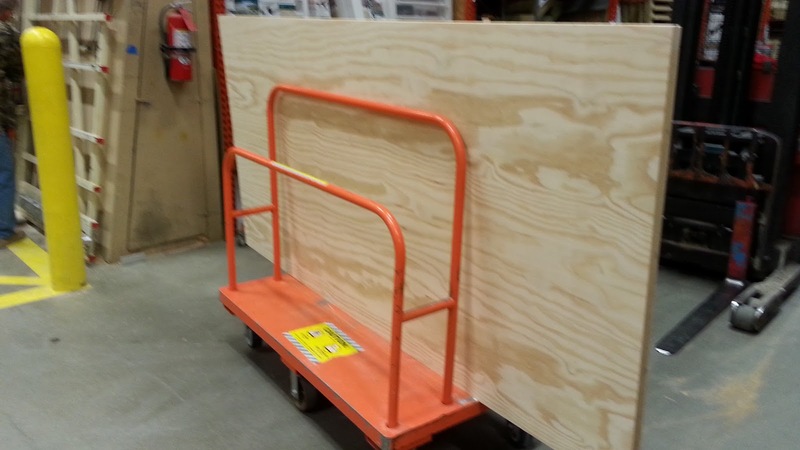 I chose 23/32" pine sanded plywood for $29.98 per sheet. There are lots of choices here and you can go with a hardwood plywood or a thinner softwood to cut cost even further but I would recommend spending the extra money and at least getting the sanded ply that is about 3/4" thick. Once I had the plywood chosen I loaded up with the help of some of the associates there and asked if they could hook me up and cut some of the plywood for me. After all, who wants to cut 6 sheets of plywood into stripes:) I was going for 8" planks since this divided evenly from 32 and it seemed like a good size for that farmhouse look. They said they could cut it into 16" stripes for me but no less due to safety concerns. 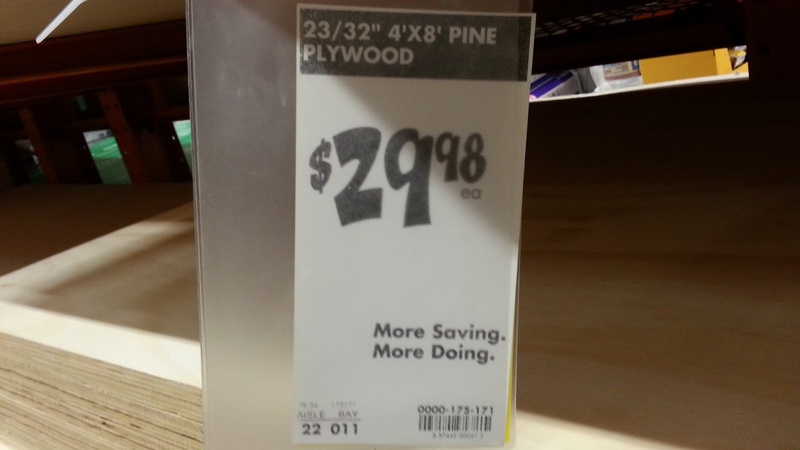 ( I went back for more on a second trip and they did cut it down to 8" except for the last cut on each piece of plywood). Back home I had already removed that nasty carpet and padding and also took out the moldings along the floor. I then laid down some roofing paper or tar paper that I had left over from another project to cover the subfloor. I used a staple gun to secure it to the floor. This will provide a sound barrier and also liquid barrier for the OSB subfloor below. Out in the garage I used my $5 super fancy table saw to rip the boards that were not cut at the store into 8" strips. I then carried them inside and placed them in the room for a day or so to acclimate to the humidity and temps inside. I wanted each plank to be a bit pronounced from it's neighbor and my wife came up with the idea of rounding the edges. The thought of rounding the edges of all of those planks was a bit overwhelming at first but it actually didn't take that long at all. I made a quick sanding block from a piece of 2X4 and sandpaper and quickly knocked the edge off of all of the top edges. I went through first and picked out the best sides and stacked them accordingly to make things easier. Now the fun part, nailing! I started by using a chalk line to mark a line long ways down the room at close to the middle of the floor. This gave mea good starting point to work outward in both directions with the planks. I didn't want to just start on one side and work all the way across fearing that I might be off by too much for the molding to cover once I reached the other side. I am using a pneumatic brad nailer to secure the planks with 1 1/4" nails. I chose to use a random pattern with everything. So no two seams will line up and no two nails are right next to each other. This was easiest to layout, looks the nicest, and has the least amount of waste. I did not leave any gaps between boards either on the sides or at the ends. Most of this wood is fairly "wet" still and will shrink a bit. Also, plywood by design does not expand and contract much vertically so I am hoping for no real expansion and contraction issues. Only time will tell and I will keep you updated on that. I couldn't be happier with the first stage of this process, it looks like a real old school farmhouse floor. The boards lay nice and flat and the sanded edges make them look like hardwood planks. In the next phase I will go through sanding and finishing the flooring to give them a classic hardwood look. Stay tuned for that article and video soon. Thanks for checking it out! Applause for the well-written blog post! Yes, I agree with you about wood flooring is the much better option than plywood as it is long lasting, durable and less expensive. Thanks for sharing and keep posting such kind of blog posts! Excellent Post! Thanks for sharing such a great information, Keep up good the work. Get best Hardwood Flooring in Cochrane. One of the homes had quite recently been sheeted and was prepared for the second floor confining divider design. The confining foreman chose not to chip away at that home, until the point when the wood makers delegate turned out to investigate the compressed wood. I find a very good website for the commercial flooring contractor , If you want you can visit this site.